This architecture-inspired design contains texture-rich patterns and shapes that work beautifully with handpainted sock yarns in solid, semi-solid and variegated colors. These socks are knit from cuff to toe. Two needle sizes are required; a larger needle size for the cuff as the pattern involves slipped stitches which will tend to pull the cuff tighter. The leg and foot pattern is a simple one, easy enough for that take along knitting! 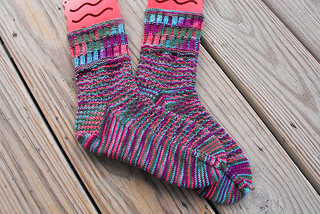 The holes, Lucy Neatby inspired, are a fun design element which really highlight the beautiful colors in the yarn. I thank Lucy for showing us that holes can be a good thing in socks! Knit them up and walk to your own beat!